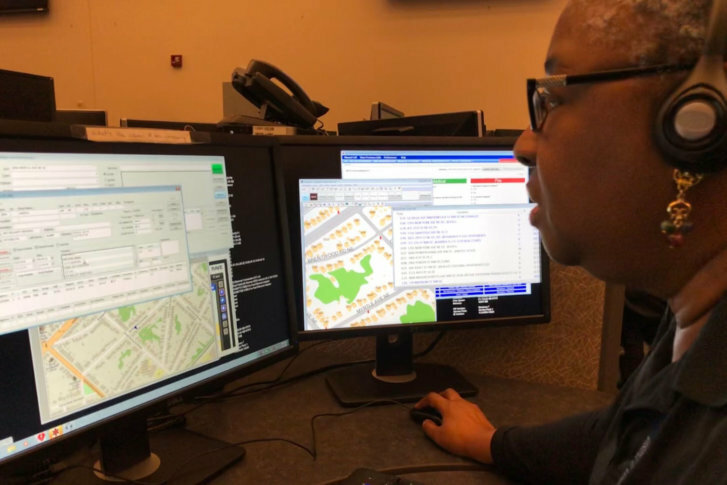 The D.C. Office of Unified Communication and 911 call centers in Maryland and Virginia have rolled out a new system that uses a cellphone users' data to help pinpoint their location when they call for help. WASHINGTON — The data collected by your cellphone is proving to be a rich resource for 911 call centers trying to pinpoint the locations of people calling for help from mobile devices. In D.C., nearly 80 percent of calls to 911 come from cellphones. “Some people know where a location is, but they don’t know the actual address,” said D.C. 911 call operator Angela Williams. The system can help callers who are in unfamiliar cities; lost someplace with no landmarks, such as in the woods; visiting friends; and the very young or incapacitated. In Fairfax County, Virginia, where 82 percent of calls for help come from cellphones, RapidSOS has been operational for about nine months. Steve McMurrer, 911 systems administrator, said he finds it particularly useful for indicating where someone is in a building. “We use other tools other than satellites to get your location,” Robertson said. A phone’s pedometer measures steps that can suggest where someone is, Wi-Fi access points send out signals, and Bluetooth devices can act as beacons. Robertson expects the use of altitude apps might eventually help the system detect what floor someone is on. “It doesn’t tell us yet what floor they’re on, but can tell us, ‘This person is in the building on the left side of the building’ versus standing out front,” McMurrer said. The transfer of data only occurs during active 911 calls, officials stressed. Arlington County, Virginia, receives 75 percent of its emergency calls from wireless phones. The county is currently upgrading to a Next Generation 911 capable system that will have RapidSOS fully embedded into the system. In the meantime, it will be using a “lite” internet portal-based version. Approximately 85 percent of 911 calls in Prince William County come from wireless phones. Prince William County expects to implement a product soon that will include RapidSOS.